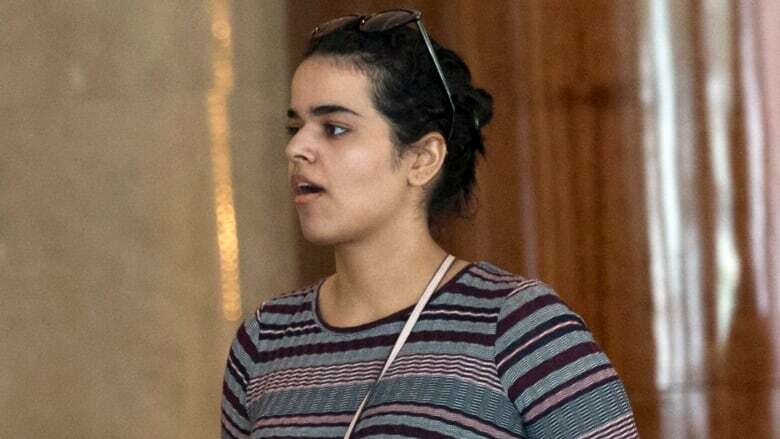 Canada will accept a Saudi teenager who fled alleged abuse from her family as a refugee and has spent nearly a week barricaded in a Bangkok hotel room, says Prime Minister Justin Trudeau. Canada will grant asylum to a Saudi woman who fled alleged abuse from her family and has spent nearly a week barricaded in a Bangkok hotel room, says Prime Minister Justin Trudeau. The prime minister was asked about whether Canada would accept Rahaf Mohammed al-Qunun, 18, as a refugee during a media availability in Regina on Friday. "The [UN High Commissioner for Refugees] has made a request of Canada that we accept Ms. al-Qunun as a refugee and we have accepted the UN's request that we grant her asylum," he told reporters. The young woman's story made international headlines after she was stopped at a Bangkok airport on Saturday by Thai immigration police, denied entry and had her passport seized. She then barricaded herself in an airport hotel room and launched a social media campaign on Twitter, which drew enough support to convince Thai officials to admit her temporarily under the protection of UN officials. The UNHCR eventually granted her refugee status on Wednesday and several countries, including Canada and Australia, had been in talks with the United Nations refugee agency to accept her. Thailand's immigration chief told reporters earlier on Friday that she's already on her way to Toronto. "Canada has granted her asylum," Surachate Hakpark told Reuters. "She'll leave tonight at 11:15 p.m.," which is 11:15 a.m. ET. The UN agency thanked both governments for their quick response and specifically thanked Canada for accepting al-Qunun and arranging her travel. "Refugee protection today is often under threat and cannot always be assured, but in this instance international refugee law and overriding values of humanity have prevailed," UN High Commissioner for Refugees Filippo Grandi said in a statement. The statement said the "fast-track" mechanism that allowed for al-Qunun to come to Canada so quickly "is available only to a fraction of the world's 25.4 million refugees, typically those at greatest risk, such as women at risk." Al-Qunun's case has highlighted the cause of women's rights in Saudi Arabia. Several female Saudis fleeing abuse by their families have been caught trying to seek asylum abroad in recent years and returned home. Human rights activists say many similar cases have gone unreported. When asked if bringing al-Qunun to Canada could further inflame tensions with Saudi Arabia, Trudeau would only say Canada is standing up for human rights. In recent weeks Canada has issued sanctions against 17 Saudis linked to the killing of dissident journalist Jamal Khashoggi inside Saudi Arabia's consulate in Istanbul, Turkey and is reviewing its deal to supply light armoured vehicles to the kingdom. Before that, Canada and Saudi Arabia were engaged in a diplomatic spat over a federal government tweet criticizing a Saudi civil rights crackdown, prompting the kingdom to expel Canada's ambassador and ordering their citizens studying in Canada to leave. "Canada has always been unequivocal that we will always stand up for human rights and women's rights around the world," Trudeau said. "This is part of a long tradition of Canada engaging constructively in the world and working with our partners, allies and the United Nations. When the United Nations made a request that we grant Ms. al-Qunun asylum we accepted." Canada's former ambassador to Saudi Arabia Dennis Horak, who was the one expelled this summer during the tweet firestorm, told CBC News that the Saudi government won't be thrilled with this news. "Some in Saudi Arabia will say it is interference in a family matter," he said. "It is not going to help the Canada-Saudi relationship but it is absolutely the right thing to do." Sophie McNeill, a reporter with the Australian Broadcasting Corporation who has had exclusive access to al-Qunun​, said Friday that al-Qunun shut down her Twitter account, but is "safe and fine." "She's just been receiving a lot of death threats," McNeill wrote, adding that al-Qunun​ would be back on Twitter after a "short break." Al-Qunun​ had previously said on Twitter that she wished to seek refuge in Australia. Australia's Foreign Minister Marise Payne met with senior Thai officials in Bangkok on Thursday. She later told reporters that Australia was assessing Al-Qunun​'s request for resettlement.